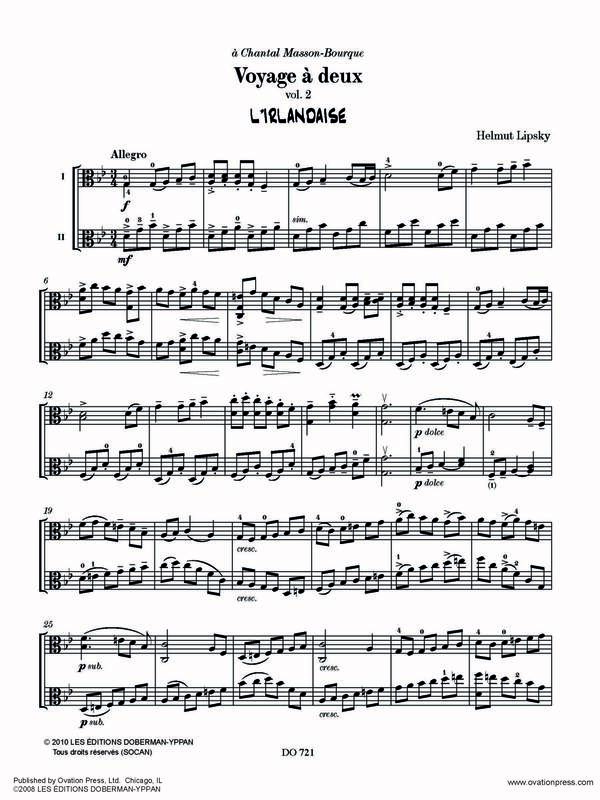 Thanks to the success and popularity of the volumes Voyage à deux (Trip for Two) for two violins, I adapted volume 2 for two violas. It explores the whole range of the instrument and playing in double stops, addressing itself therefore to students at the intermediate and advanced levels. Stylistically, this collection leads still further away off the beaten track than volume 1 and is a reflection of my own musical preoccupations of the last years: jazz, latin music, tango, the folk music of various cultures, as well as my experience as a composer of film music... The pieces represent interesting challenges for the curious and adventurous musician, either at the level of finding the right sound colors for the proposed style, the use of glissandi and various types of vibrato, including non vibrato, the rhythmic language, and the intonation when playing layered double stops, evoking at times the sound of a string ensemble instead of a simple dialogue. The pieces are not organized in an order of difficulty of execution, but rather by contrast and variety. Have a nice trip! Click below to watch "Le duo des beaux ténébreux" with violists Chantal Masson-Bourque and Karina Laliberté perform Nocturno Español, Big Shuffle, L'Irlandaise and Lamentation, four of the ten duos included in Voyage à deux (for Viola Duo). Click below to watch The Slapin-Solomon Viola Duo perform Tango in blues and Lamentation, two of the ten duos included in Voyage à deux (for Viola Duo).